Picture - Plx�schow's seaplane, the Heinkel HD 24 "Tsingtau"
The Heinkel HD 24 was a training seaplane developed in Germany in the late 1920s. It was a conventional single-bay biplane with equal-span, unstaggered wings. The fuselage was braced to both the upper and lower wings with a number of struts on its sides, in addition to the normal cabane struts. The pilot and instructor sat in tandem, open cockpits, and the undercarriage consisted of twin pontoons, although this could be readily exchanged for wheels or skis. Heinkel entered two HD 24s in the Seeflugwettbewerb seaplane competition in 1926, leading to orders by the DVS (23 aircraft) and the Swedish Navy. The latter aircraft were to be built in Sweden by Svenska Aero based on two pattern aircraft provided by Heinkel. Before the Swedish examples could be delivered, the Flygvapnet had assumed responsibility for Swedish naval aviation, and so took delivery of the six domestically-produced machines, designating them Sk 4. 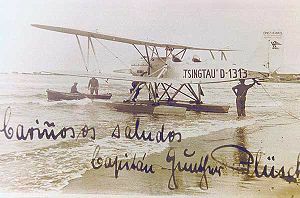 One HD 24 was exported to China, and another was bought by German explorer Gunther Plx�schow who named it Tsingtau and took it on an expedition in 1927-28 to Patagonia and Tierra del Fuego. The journey was recorded in his book and documentary film Silberkondor x�ber Feuerland. A full size replica of the Tsingtau D1313 is being assembled for static display as of April 17th, 2009, in Puerto Madero, Buenos Aires, Argentina. It is located at about 500 of Alicia Moreau de Justo Avenue. Heinkel HD 24 Pictures and Heinkel HD 24 for Sale.